Protective clothing offers the wearer reliable protection against health risks and environmental effects related to their job which cannot be avoided in their line of work. In Germany, for example, protective clothing amounts to about 40% of the total market for personal protection equipment (PPE), thus being the biggest individual business segment for PPE, followed by hand protection (22%) and protective footgear (14%).1 Depending on the field of application, textile PPE protects against outside influences such as intense heat and flames, cold and wet, all types of mechanical and physical stresses, from cuts to spray from molten metal and sparks through to electricity and electrostatic charges, chemical substances and gases and poor weather. And in many instances, protective clothing requires combined material and functional properties in order to fulfil its intended purpose. Clothing for the rescue services, for example, must guarantee good visibility in traffic in all lighting and weather conditions, offer protection against mechanical and climatic influences (wet, wind, cold) and be constructed in such a way that should it become contaminated with pathogenic agents, the clothing can be treated using a validated disinfection process. All three categories of personal protection equipment require an EU declaration of conformity from the manufacturer or their agent, in accordance with Appendix VI of EU Directive 89/686. PPE in Categories 2 and 3 is also subject to EU type examination from a notified body. For complex PPE in Category 3, a quality assurance procedure in compliance with Article 11 of the EU Directive also has to be followed, i.e. regular product monitoring at yearly intervals. The additional requirements of Annex II in EU Directive 89/686/ EEC have been converted into harmonised European norms. The norms control aspects such as the area of application for protective clothing, safety-relevant properties of the material (e.g. colour, luminance in warning clothing), or the design specifications and performance of the textiles. However, certification as PPE is always given exclusively on the basis of Directive 89/686/EEC. That is to say, manufacturers of protective clothing may deviate from the norms, so long as they can prove that their products comply with the requirements of the Directive in ways other than those quoted in the norm. The harmonised norms, in accordance with which protective clothing is tested, are published in the official journals of the EU states. 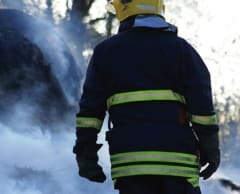 Protective clothing that is comfortable to wear plays an important part in ensuring that the wearer feels physically at ease doing his job and is motivated to perform well. If physiological comfort is overlooked, it not only makes for a low level of acceptance by the employees, but physical and mental performance also suffer. This is a factor that is all the more important, the greater the risks to which the wearer of protective clothing is exposed in the workplace. Many different aspects are involved in defining physiological comfort, but it is no longer correct to assume that this is a subjective criterion. Comfort characteristics can be measured objectively. Objective methods of assessment and drawing up guidelines for the design of protective clothing which support bodily functions as well as possible include the thermo-physiological comfort, the skin sensorial comfort and the ergonomic comfort. It is essential for thermophysiological comfort that body temperature remains within a range that people find comfortable and that puts little strain on the body. The limits are determined by the physiological processes that go on in the body. Since heat exchange in the human body takes place to about 90% through the skin, clothing, which covers most of the surface of the skin, plays a crucial role in the way the body’s own temperatureequalising function works. Optimal PPE garments should therefore ensure that the wearer maintains a reasonable body temperature in the widest possible range of ambient temperatures and degrees of exertion. The materials which are used are an important factor in effective and rapid heat exchange. The comfort characteristics of textile fabrics can be determined by means of a Skin Model that allows testing for such parameters as thermal insulation, water vapour resistance (breathability), water vapour absorbency, buffering capacities against vaporous and liquid sweat impulses, and drying time. In order to be able to make predictions about the comfort characteristics of the finished garment or range of clothing, life-size thermoregulatory models of man, (e.g. in the form of the thermal manikin “Charlie“ at the Hohenstein Institute) are used. These simulate heat production in the human body and, in a climatecontrolled room, also can imitate certain sequences of movements. The figures that are worked out from particular measurements can then be extrapolated using predictive modelling techniques. This allows making reliable predictions about the range of utility for the garment, i.e. information about maximum and minimum ambient temperatures where it could be used. The skin sensorial comfort also plays an important role in the acceptance of protective clothing. Clothing that clings to skin which is wet with sweat is perceived as dragging and restrictive when people move about. Textiles to be worn next to the skin should therefore be napped on the side next to the skin and designed so that they do not stick to the surface of the skin. They should also be made so that they can wick large quantities of sweat away to layers that are not in contact with the skin. To meet these requirements the most important thing is the construction of the underlying textile from which a garment is made. Sensorial comfort for the skin can also be quantifiably assessed by special measuring procedures. For example, the extent to which a textile “clings“ to skin that is wet with sweat is simulated on apparatus to measure adhesiveness, resulting in a wet cling index. Other pieces of apparatus are used to measure the number of contact points between the textile and the skin, and the sorption index. Ergonomic comfort includes among other things the fit of the clothing. To adequately assess the fitting, garments are tried on by models whose measurements match the size given on the label. The fitting tests for protective clothing, as for everyday wear, are usually based on sizing charts for ladies’ outer clothing and for men’s and boys’ clothes. Experienced clothing specialists assess the garments for length and width, fitness for purpose, ease of movement and functionality, as well as for their appearance. This test should not only be carried out on new garments but also after they have been cleaned, i.e. washed, cleaned and dried. Ideally, the fit of a garment, like the condition of the material, seams etc. should remain unchanged. In view of the many specific risks and health hazards to which the wearer of protective clothing is exposed in his workplace, it is important that the clothing should not only have excellent functional properties but should not itself be a source of any danger to health. A first step towards textile PPE that is free of harmful substances is made in the standard EN 340 (Protective clothing: General requirements) which includes the guideline that protective clothing should not contain any azo dyes, and should have good fastness to perspiration as well as a skinbalanced pH-value. Extensive requirements with regard to the human ecological quality of protective clothing, however, are provided by the label “Confidence in Textiles - tested for harmful substances according to Oeko-Tex® Standard 100” that has served as a reliable guide when buying protective clothing for the last 17 years. At the moment, the International Oeko- Tex® Association includes 14 textile testing and research institutes in Europe and Japan with representative offices in more than 40 countries around the world. Only these member institutes are authorised to test and certificate textiles for compliance with the specifications of this standardised list of criteria. The Oeko-Tex® Standard 100 is an independent certification system for textiles and garments from all stages of production. Labelled products such as protective clothing are tested for an extensive range of harmful substances based on the latest scientific findings and legal regulations. The label is only awarded if all components of an article meet the defined requirements. The test criteria are universally binding and are adapted to the latest findings every year. They comprise substances which are prohibited or regulated by law, chemicals which are known to be harmful to health and parameters which are included as a precautionary measure to safeguard health. Taken as a whole, they go way beyond national legislation and create an advantage in terms of transparency and comparability against a background of varying environmental standards in the countries of production. An important benefit of the Oeko- Tex® System is the application-based risk assessment of possible harmful substances in textiles. In general the rule is that the more closely a textile is in contact with human skin, the stricter are the human/ecological Article | Protective Clothing requirements that have to be met in testing. Because protective clothing sometimes comes into direct contact with the skin and is also often worn for long periods, it has to satisfy the criteria for Oeko-Tex® Product Class II (textiles in direct contact with the skin). An additional benefit of modern protective clothing is reliable protection against harmful UV radiation. Groups such as builders and street cleaners, gardeners, electricians or foresters, who do their work in the open air or who work in particularly sunny parts of the world are exposed to higher levels of natural UV radiations. In other industries such the manufacture of UV machines (e.g. sun-beds), employees come into contact with dangerous UV radiation from artificial sources. In view of the global increase in skin cancer cases, the International Test Association for Applied UV Protection has developed the UV Standard 801. This independent and internationally valid testing and certification system makes it possible to calculate the UV protection factor of textiles objectively. An important advantage of this measuring process is that, unlike other test methods (for example the Australian/New Zealand norm), it also takes account of the condition of the textile product in use, i.e. criteria such as the strain imposed on a fabric by stretching or wetting, or mechanical wear due to wearing and washing. The figures that are calculated are always based on worst-possible scenarios, i.e. assuming maximum UV radiation and the most sensitive skin type. The final protection factor which the customer sees on the label in the garment is based on the lowest measurement taken during performance testing. Many textile and clothing manufacturers around the world have already taken advantage of the opportunity to have their products certificated by the International Test Association for applied UV protection. The scientifically based benchmark of UV Standard 801 also guarantees the user of protective clothing realistic and reliable predictions about the UV protection provided by the garments they are wearing. In order to maintain the functional properties of protective clothing for long periods and to keep them hygienic, textiles must be properly cared for. Proper care of textile PPE does not only start after using the garments, but rather also involves competent knowledge long before the textiles are marketed. Independent specialists such as the PPE testing and certification team at the Hohenstein Institute offer advice on this, for example, to the manufacturers of protective clothing, on choosing materials for the planned application, providing special care instructions or carrying out technical wash tests to ensure that the textiles are fit for the purpose and can be used for the long term. The experts at Hohenstein are also involved in writing norms and validating appropriate treatment processes. Founded in 1946, the Hohenstein Institute in Bönnigheim, Germany, has been working for over sixty years on finding innovative solutions for the whole textile production chain and sees its role as a full-service provider in the fields of application based research, testing and certification. Hohenstein Institute is also notified as European Test and Certification Centre for Personal Protection Equipment in accordance with EU Directive 89/686 (Notified Body 0555), and has over 30 years’ experience in testing and developing protective clothing for clients such as textile manufacturers, manufacturers of ready-madeclothing, retailers and importers. The Hohenstein scientists bring together core competencies in the specialist areas of clothing manufacture, clothing physiology, materials testing, textile care, textile finishing and textile hygiene, in a way that is unique in the world. This interdisciplinary approach together with the many years of experience distinguishes the Hohenstein experts when it comes to translating the broad range of requirements with regard to PPE into suitable practical products. An advantage that has been valued for years by many well-known manufacturers is the opportunity not only to test the finished protective clothing but also to test all the primary products when they have been processed. Another service offered by the Hohenstein experts, in addition to purely testing and certificating personal protection equipment, is also the development of innovative protective clothing for company-specific purposes. Another area of work concerns barrier textiles for medical use. Operating theatre textiles such as the patients’ robes, and theatre gowns, caps and masks should protect both the patient and hospital staff from infection. The Hohenstein scientists work firstly on optimising the barrier effect of textiles and researching suitable methods for testing the protective effect of medical textiles. At the same time, however, they are working on developing and validating new cleaning methods so as to improve existing standards of hygiene still further.